On June 1, President Ilham Aliyev ordered a restructuring of his staff that amounted to the ouster of its deputy chief for military and security affairs Vahid Aliyev and head of its military department Meherram Aliyev. One other advisor and several aides were also sacked or reassigned. The move comes amid an unprecedented investigation aiming to uncover “Armenian spies” inside Azerbaijan’s armed forces. The presidential administration – led by the country’s “grey cardinal,” 79-year-old Ramiz Mehdiyev, and run out of the former building of the Central Committee of the Communist Party – is where most of the country's day-to-day affairs are run. As such, changes within this administration often bear greater political significance than cabinet or parliament reshuffles. While there has been virtually no published analysis in the tightly controlled Azerbaijani press of the move’s significance, it appears to be a continuation of the intricate intra-clan balancing act that included the appointment of Ilham Aliyev's wife, Mehriban Aliyeva, as the country's vice president. Vahid Aliyev has been a key member of the security apparatus for 15 years, and was among key officials present at the February event announcing Aliyeva's appointment. In recent years, Vahid Aliyev also saw his influence rise, with several of his former aides getting top positions in the defense ministry following a reshuffle in that organization in 2013. 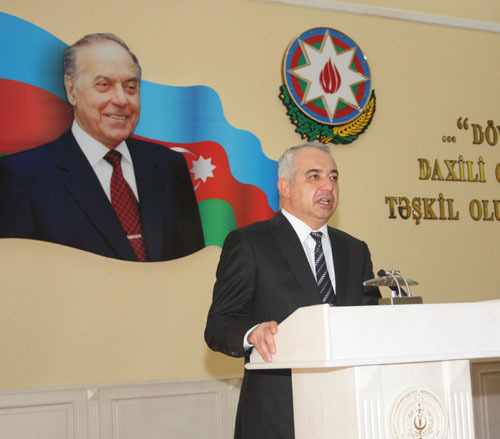 While the vast majority of Azerbaijan’s senior security officials come from either Nakhichevan or Armenia, Vahid Aliyev’s family is from Gyzyl Shafag, a village only stone’s throw away from Heydar Aliyev’s native Jomardli in Armenia’s Sisian district, although it's not known whether the two are related. Vahid Aliyev’s rise through the ranks of the security services was swift, and he made general at 34. As one of the few top security officials to speak English, he became a key interlocutor for Western and Israeli security officials, as well as to Russians, and reportedly drafted Azerbaijan’s military doctrine. Meherram Aliyev, a former long-time Baku police chief, was brought into the president’s office in 2012 as head of the military department, apparently to undercut Vahid Aliyev’s influence. Meherram Aliyev was previously allied with Heydar Aliyev’s late brother Jalal Aliyev and now imprisoned former health minister Ali Insanov, two of Ilham Aliyev’s main challengers in intra-clan politics of 2003 transition. After a stint as Azerbaijan’s ambassador in Dushanbe, the former Baku police chief subsequently made good with Mehriban Aliyeva’s side of the ruling family. With the sacking of Ministry of National Security chief Eldar Mahmudov and disbanding of the ministry in 2015, the chief of its successor State Security Service Medet Quliyev appears to be the new rising star of Azerbaijan’s security community. Under Quliyev, the service has launched increasingly ruthless crackdowns against both alleged Islamic terrorists and alleged “Armenian spies” inside Azerbaijan’s armed forces, with his agency killing at least 18 suspects during arrest or interrogation in the last nine months. It is not yet clear if Vahid Aliyev – a military counter-intelligence official for most of 1990s – will be blamed for the failure to uncover the “spies” or other traitors in the army. On June 5, Meherram Aliyev was appointed deputy minister of justice, the position previously held by Medet Quliyev. There is no news on Vahid Aliyev’s future for now, but Fuad Aleskerov, a 23-year veteran of the presidential staff overseeing police and courts, has reportedly taken over Vahid Aliyev's military/security portfolio.